Logitech surround sound speakers z506—for when you want to be moved by big, 5.1 surround sound from your music, movies and games. 75 watts (RMS) of balanced power and room-filling sound. On-speaker bass control lets you easily dial the bass level up or down. 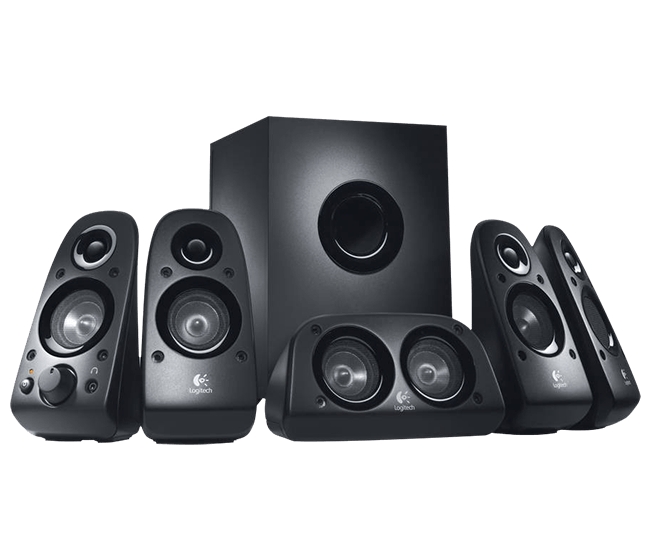 The Logitech Speaker System Z313. The easy way to kick back and enjoy your music. The convenient control pod makes it easy to control volume and even plug in your headphones. 25 watts (RMS) of power fills your room with big, balanced sound. The compact subwoofer fits into tight spaces, delivering deeper bass when you want to feel the beat. Boldly designed with an amazing innovation that will easily fit into your style, the KES-350 Stereo Speaker System allows complete file transferability, so you can enjoy the convenience of accessing more digital music via the built-in USB direct and SD card slots. Boasting 36 watts of continuous power, this 2.1 channel system features two full range satellite speakers and a powerful subwoofer, with master volume and bass controls conveniently located in the main unit. With its acoustically balanced wood cabinet subwoofer, this 3-piece Stereo Speaker System has enough power to fill your room with clear, undistorted surround sound – from any audio source! Get a complete sound system package with the KES-345 2.1 Stereo Speaker system. This speaker system features two full range 5-watt satellite speakers and a powerful 10-watt subwoofer with convenient volume, bass and music controls located on its front side. With USB and SD audio playback you can hook up to this system any way you like. This 3-piece Stereo Speaker System has enough power to pump clear, undistorted sound to enhance and maximize all your gaming, visual and audio experiences. The KWS-620 BluBlast Speaker System redefines the way you experience digital music. Featuring Bluetooth® wireless technology, you can now say goodbye to that unsightly cable clutter forever. By adopting the Advanced Audio Distribution Profile (A2DP), the system streams music from any Bluetooth®-enabled device within a range of up to 30 meters (100 ft.) from the audio source. With two full range satellite speakers and a powerful subwoofer, this system blasts 42 watts of formidable sound, no matter the source!